Holtby's 1.93 goals-against average is second in the NHL, and his .932 save percentage is first among goalies who have played at least 20 games. Using the same 20-game cutoff for midseason rankings, Holtby slips slightly when digging deeper into the statistics. Holtby's .939 even-strength save percentage is tied for second with Roberto Luongo of the Florida Panthers behind Petr Mrazek (.942), who has played 68 games in four NHL seasons with the Detroit Red Wings. According to war-on-ice.com, Holtby also trails Mrazek (.9464 to .9377) in adjusted 5-on-5 save percentage, a statistic that weighs the quality of shots each goaltender faces based on distance, with closer shots judged more difficult. That Holtby's adjusted save percentage is lower than his raw number is considered a sign of an easier workload in terms of shot distance. Of course, that's not the only factor in stopping pucks, and Holtby has to work to find that rhythm and flow he relies on behind a team that doesn't give up as many shots since the arrival of coach Barry Trotz, something Holtby told NHL.com earlier this season was "probably the hardest thing to do as a goalie." Holtby made that adjustment while also tightening his game and closing holes with Korn, continuing to build on a strong foundation that started with his father between the pipes and continued with mental coach John Stevenson between the ears. Add all of that up and it's easy to see why Holtby is the NHL.com midseason Vezina favorite. Roberto Luongo, Florida Panthers: The oldest goalie in the NHL, Luongo, 36, is making a strong case for also being the best. He always has been among the most consistent goalies through 16 NHL seasons, with a .920 career save percentage that ranks sixth all-time among goalies who played more than 250 games. But Luongo is playing well above that level at .930 this season. Never content or complacent with his technique, Luongo started training four days a week with Panthers goaltending coach Rob Tallas on Aug. 1, continuing to tighten post-play adjustments that started his final season with the Vancouver Canucks. 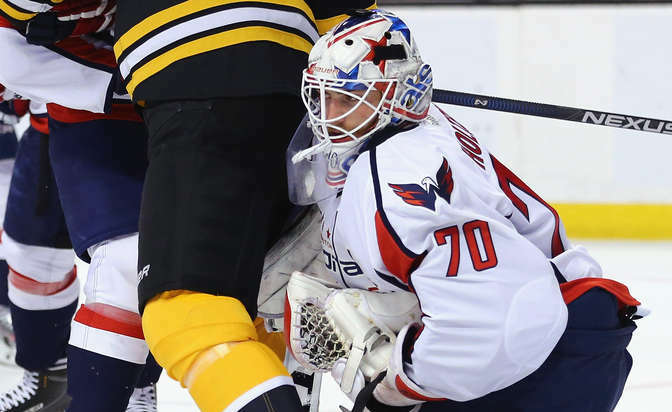 Add in a defensive system designed to play to his strengths (reading plays and controlling rebounds), and he's on pace to be a Vezina finalist for the fourth time in his career and first in five seasons. Petr Mrazek, Detroit Red Wings: The only thing keeping Mrazek, 23, from being higher on this list is games played (28). The way he continues to take ice time away from would-be No. 1 Jimmy Howard, it may not be a factor in the voting at the end of the season. Mrazek's .942 even-strength save percentage and .9462 adjusted save percentage are tops in the League. He also has a propensity for ending up on the highlight reels; his aggressive positioning sometimes forces him to make spectacular saves, which he manages to pull off because of his explosive mobility.